Heather offers one to one workshops throughout the year. 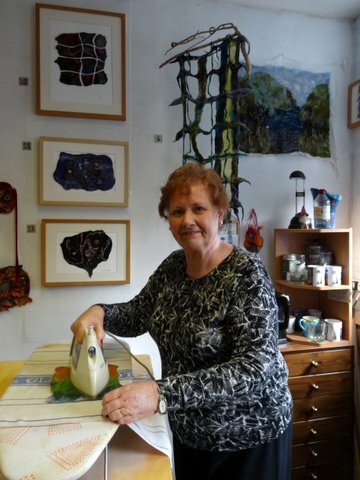 Her comfortable and bright studio in St. Margaret's House offers the perfect setting. 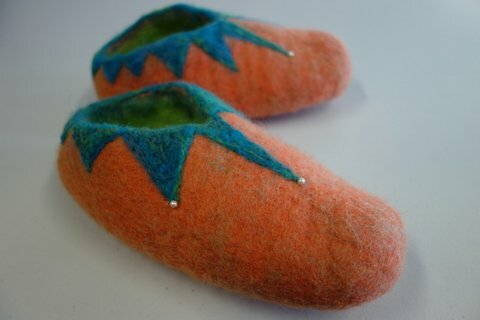 If you're new to felting, this is one of the best ways to learn essential feltmaking skills. You might then choose to go on to a specialist class, such as nuno scarves, vessels or hats. "I have learnt some very useful techniques and thoroughly enjoyed my day. 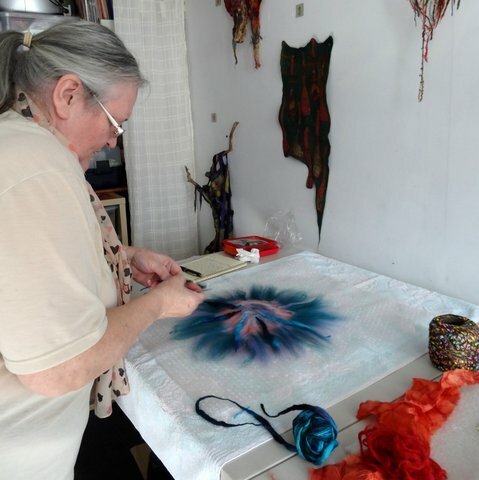 Heather is a great tutor and her work is beautiful." When you're visiting Edinburgh for only a few days, Heather can offer a workshop especially for you, at a time which suits you best (subject to availability). Workshops are also available for teachers who want to develop new art and craft skills for the classroom. "Very enjoyable day. Step by step instructions, great results. Would recommend this and other workshops." 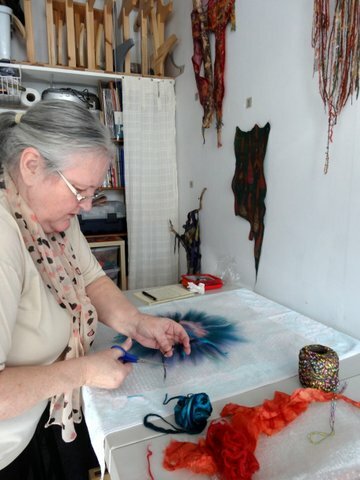 A One to One Feltmaking Workshop costs £25 per hour. There's a minumum session of 3 hours. All materials are included. Workshops can be booked on Tuesday to Saturday, subject to availability. Would you like to come with a friend? Two participants pay £20 each per hour (minimum 3 hours, materials included). ﻿One to One Workshops﻿ are inspiring events for me. Always intensive and quite hard work. Always lots of fun. 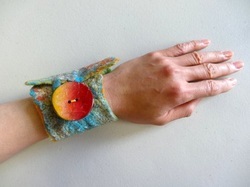 "I love your workshops Heather, I always find I learn so much more than just a new felting technique. You provide hints and tips about design, styling, surface decoration and of course fine finishing - especially on a 1-2-1 workshop - things I can't learn from reading a book or watching a YouTube video. So thank you very much and I look forward to the next one!" 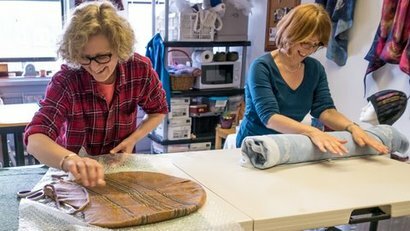 Give a fantastic experience of creativity and crafting skills with a Feltmaking Workshop Gift Voucher. Gift Vouchers for Heather's popular workshops are now available. If you'd like more information, please get in touch. 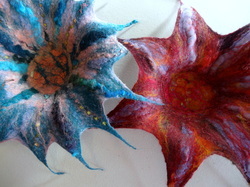 Heather Potten is an excellent, skilled, patient and inspiring felt making teacher. I booked Heather at short notice for a one to one workshop and I absolutely loved it. Heather is very thorough and makes you feel that you are getting a real masterclass in the art of felt making. She is committed to sharing her knowledge and ensuring that when you leave you should be equipped to carry on developing your own work. I am so looking forward to working with Heather again and enjoying her calm, beautiful work space. Thank you Heather, you're an inspiration!